Bamboo season means happy gorillas and extra work! 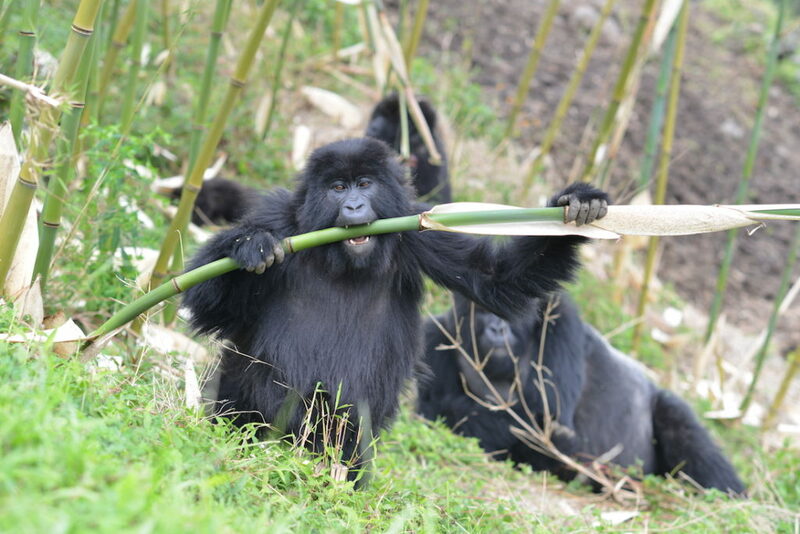 Bamboo shoots are a favorite food of the mountain gorillas we monitor in Rwanda, and they are produced during two seasons each year – spring and fall. Since the Fossey Fund has been studying bamboo for the past five years, bamboo shooting season means it’s also time for our semi-annual bamboo data collection efforts. Bamboo grows in the lower altitudes of the park and each shoot season attracts gorilla groups to come down to feed on this favored plant. 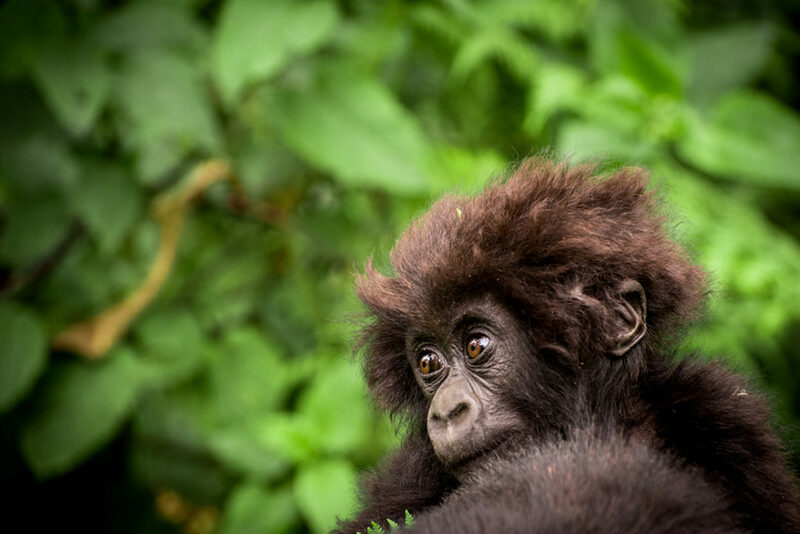 But some years are more productive than others in terms of bamboo abundance, and having the gorilla groups at lower altitudes – near human communities and closer to other gorilla groups – can sometimes pose issues. 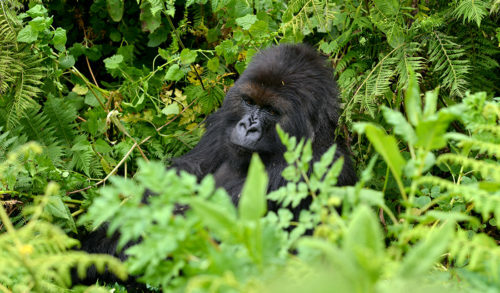 These include gorillas wandering out of the park and sometimes feeding on community crops. For these reasons, Fossey Fund staff have been studying bamboo each shooting season, to learn more about the dynamics of this plant as well as the relationship to the gorillas’ ranging patterns. Golden monkeys also enjoy this food, and are another important part of our biodiversity studies in the park. 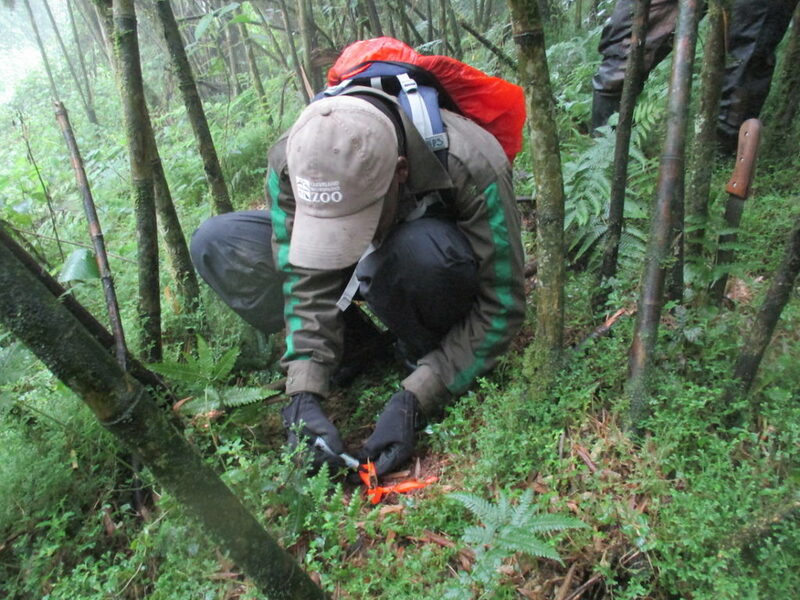 Bamboo data collection this year started in mid March and will continue into May. 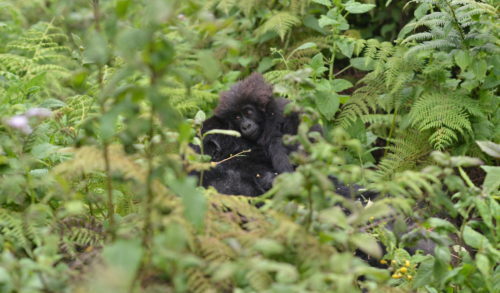 The work involves our research staff visiting 82 plots of four square meters in mountain gorilla range, and 28 plots in golden monkey range, each every two weeks. We collect information on the number of bamboo shoots, the number of mature bamboo plants, how many have been eaten, weather and other data, all of which are useful to compare to previous years and determine whether there are any important trends. Bamboo shoots fluctuate each year, but it is important to know if, as we suspect, they are declining overall, since the plants are significant to both gorillas and the golden monkeys. 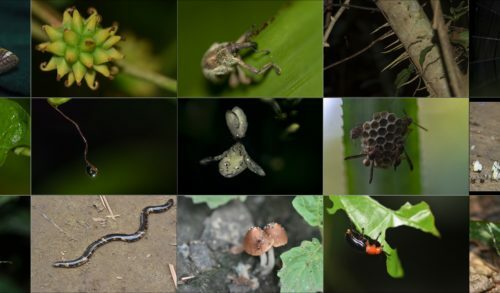 Information about the long-term bamboo trends will also help inform other aspects of our biodiversity studies, which are coordinated by Biodiversity Research Program Manager Deogratias Tuyisingize. Bamboo studies have also been a topic for some of the University of Rwanda science students who do their senior research projects with us each year at Karisoke. In fact, one of our biodiversity field assistants – Faida Emmanuel—will present our work on this topic during the International Primatological Society Congress this August in Kenya. “So far, it appears that this spring is not a very productive bamboo season,” reports Tuyisingize. “Usually when there is a good bamboo shoot season, many gorilla groups range in bamboo zone, but right now they are not.” In addition, due to the shortage in bamboo shoots, golden monkeys have been frequently going outside the park to search for alternative foods (such as Irish potato crops), he adds. 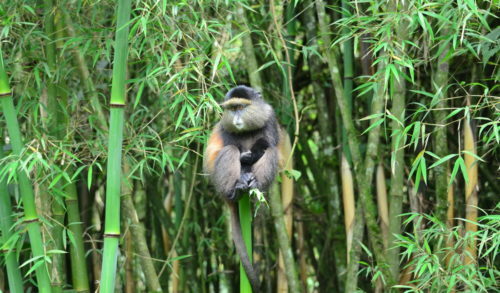 Field staff are also recording many golden monkey aggressions due to the current bamboo shortage. Studying bamboo is important because bamboo is a key food species for gorilla. 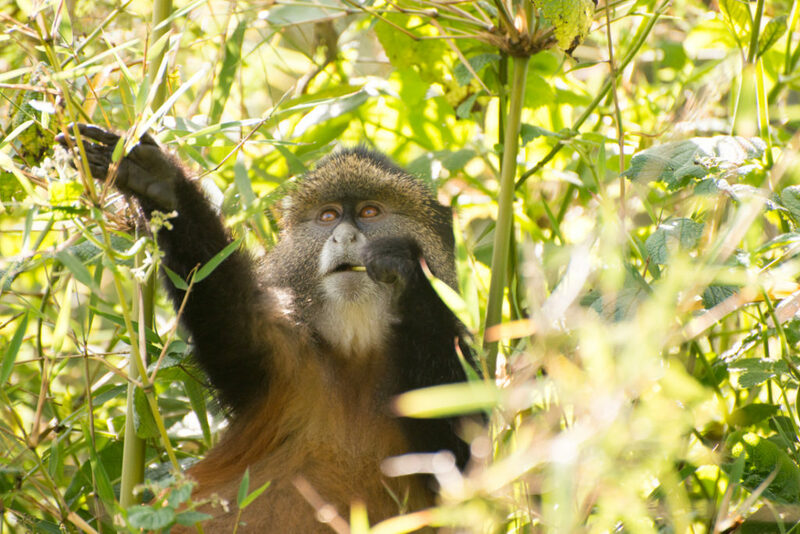 In addition, it is located in the main habitat zone for the golden monkey, Tuyisingize explains. Bamboo shoots are an important source of energy and protein for both species. Bamboo makes up 14.7 percent of total feeding records for gorillas and more than 70 percent of feeding records for golden monkeys (with shoots accounting for nearly 20 percent of this), he says. In addition, golden monkeys give birth during bamboo shooting seasons, exactly during the availability of this high-quality food. 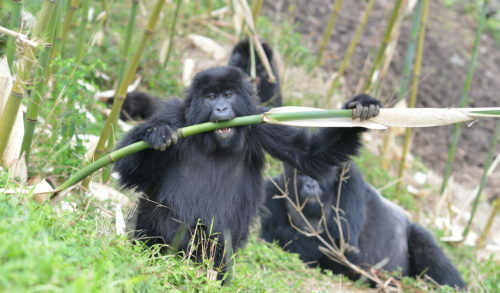 Field staff report that when gorillas fed on bamboo shoots, they get happy and play a lot. Gorillas are smart! They know when it is time to travel down to the bamboo zone to check for shoots. Golden monkey are very clever too. They time births for when there is availability of bamboo shoots, providing high-quality nutrition and helping the mothers produce milk for their young.